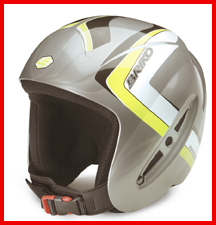 Briko is a leader in helmet technology. They have paired the Briko junior helmets with junior goggles for testing. The Forerunner Jr. utilizes a three-layer construction concept for maximum protection and comfort. An external polycarbonate shell surrounds a polystyrene internal shell (complete with air channels for temperature regulation) and a MaxiDry fabric liner wicks away moisture. Vents on the sides of the helmet, covered by plastic mesh, provide for protection while also enabling the user to hear their environment around them and a thermoplastic retention system is coupled with a heat-sealed chinstrap for a solid fit. Most importantly, the Forerunner meets or exceeds ASTM safety ratings. Features and benefits are parallel to the Forerunner Jr. with the added benefit of pre-installed bushings to which a face guard may be attached. Again the Forerunner W.C. meets or exceeds ASTM approval ratings. 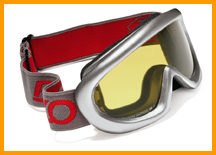 Briko Kandy goggle Designed for older children that are serious about skiing and snowboarding the Kandy goggles have a wide field of vision, multiple vents for optimal air circulation and standard face foam for a precise fit. Lenses are equipped with the proprietary Thrama technology, which are ideal for flat light and variable light conditions. 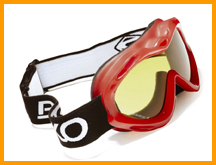 Briko Scream goggle Designed for younger skiers the Scream goggles are short on features but long on performance. Standard face foam insures a comfortable fit while multiple vents provide proper ventilation. Or visit Briko.com for more info and a list of retailers.